Greetings from Dublin airport. 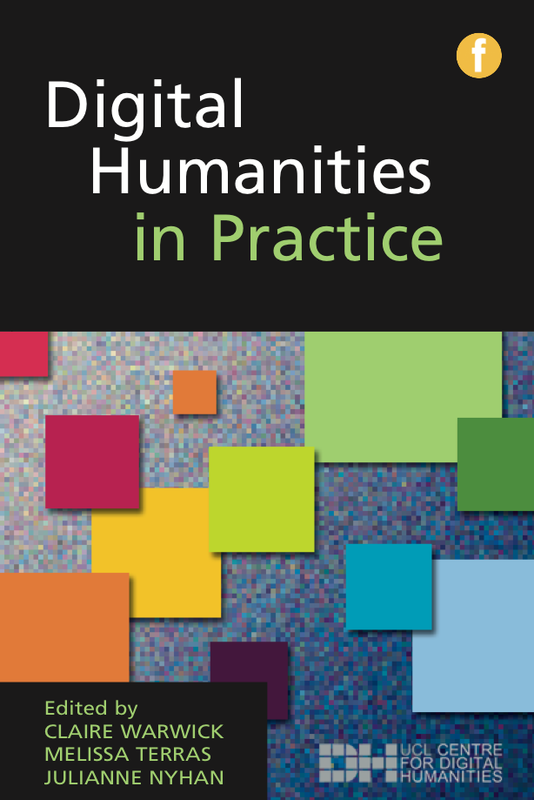 Its been a busy week - on Tuesday I hosted the first 4Humanities conference, at UCL, then jetted off to Galway, Ireland where on Thursday I keynoted at the Digital Arts and Humanities PhD Programme annual conference. The conference at UCL, entitled Showing the Arts and Humanities Matter gathered together various initiatives who are actively promoting the arts and humanities, to allow discussion regarding what is the best way forward to ensure that the benefits and contribution that the Arts and Humanities make to society is recognised. It was a fantastic day, and I learnt a lot - I'm fairly new to this area. Ernesto Priego live blogged and tweeted the event, and there is a storify of the tweets for those who want to catch up on the discussion. 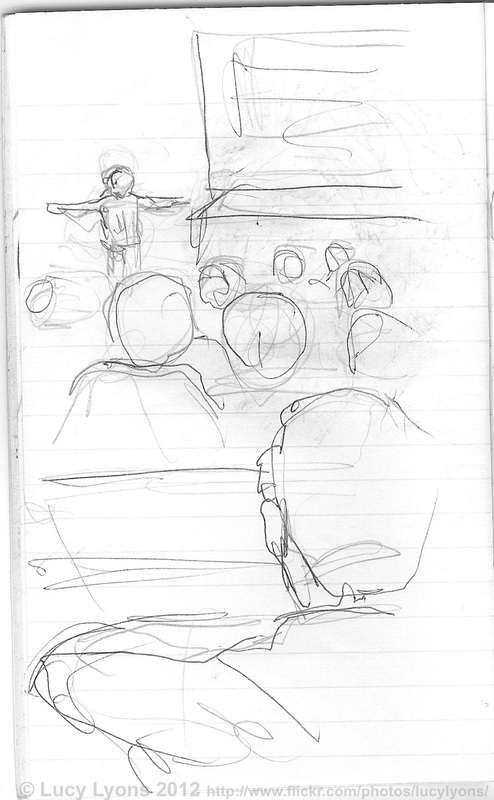 One thing we decided to do was have a practice based artist, Dr Lucy Lyons, as a conference artist in residence, sketching and note taking, using a different sort of technology (pen, pencil, paper) than the ones we usually use, in what she calls "a frenetic, haptic method of note taking and engaging with the speakers". Lucy created a wonderful set of notes and drawings of the day that capture the flavour of the event. It is interesting to reflect that our discussions seldom wandered into talking about the practice led arts - and the fact that the immediate reaction of many speakers who saw Lucy's drawings was "great! a new avatar for me on twitter!" (how we are all addicted) rather than a discussion of what integrating this process into the conference setting would show or tell us. I'm still processing that, myself - but I loved having a conference artist in residence, and hope to feature this again at future events. Time for me to check in, I'll tell you about #dahphdie at another time! For the past few months I've been obsessing about getting a new rucksack to carry my computer around. My dear, cheaply purchased a decade ago, rucksack is finally giving up the ghost (but to tell the truth it was the best rucksack I could find at the time on a very limited budget, and Husband winds me up that it looks like I'm always going camping when I go to work). I have to have a rucksack to watch out for weight distribution over my back, but also I feel more secure with a backpack on, walking through London. Time to hit the shops! There is a serious gap in the market for smart, professional looking backpacks. I've done a trawl of the internet, and for the past day or so been chatting to various people on the twitters who wanted to know what I dug up, so here, for your "back to school special" is a roundup of the best laptop bags I have found. 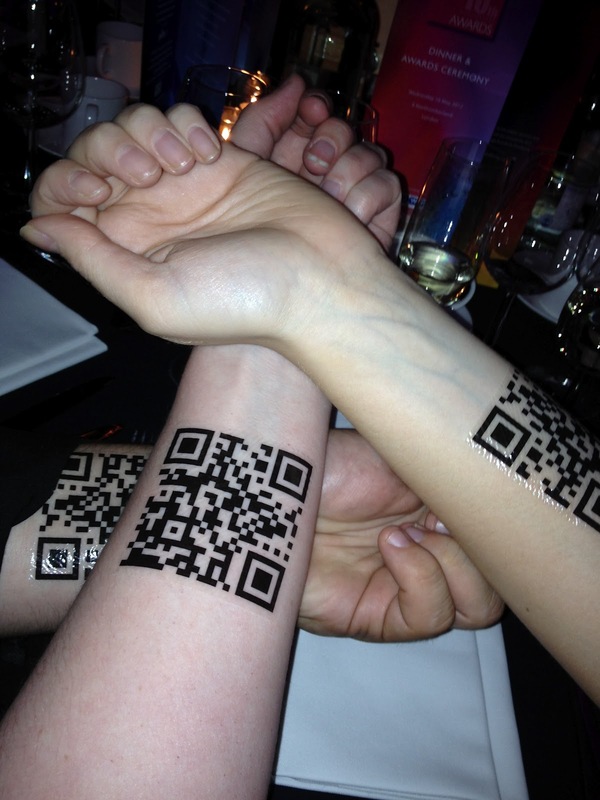 Nothing quite complements a black tie outfit like a tattoo that, when scanned, leads to your (award winning) project website. You saw it here first! It was a big night for UCL last night, with folks from UCLDH, CASA and Museums and Public Engagement, heading down to the 10th annual Museums and Heritage Awards where we were nominated in three different categories, and I'm pleased to say that the QRator project won the Innovation category! QRator is a collaboration between the UCL Centre for Digital Humanities (UCLDH), UCL Centre for Advanced Spatial Analysis (CASA), and UCL Museums, to develop new kinds of content, co-curated by the public, and museum staff, to enhance museum interpretation, public engagement and meaning making by establishing new connections to museum exhibit content. Its a truly interdisciplinary team, including Mark Carnall and Jack Ashby from the Grant Museum, Steve Gray and Andy Hudson Smith from CASA, Susannah Chan and Sally MacDonald from UCL Museums and Public Engagement, and Claire Warwick and I from UCLDH. Well done team - and thank you all for your hard work, and for letting me join in the fun! As well as the blog posts from the Grant Museum and Claire Ross, Andy Hudson-Smith has a good write up on his blog about the QRator team and the award - I dont think I can add much more than these three posts cover, except that I'm delighted! Me, I got the temporary tattoos made up which we had fun baffling other attendees with. And drank some wine. 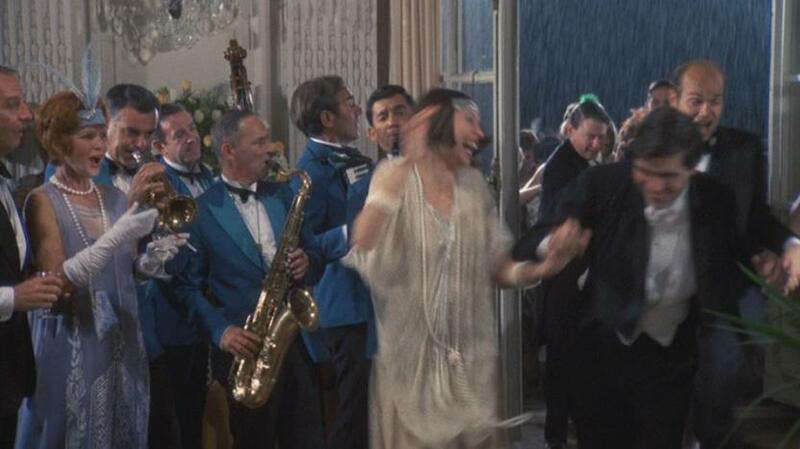 And grinned into the wee small hours! 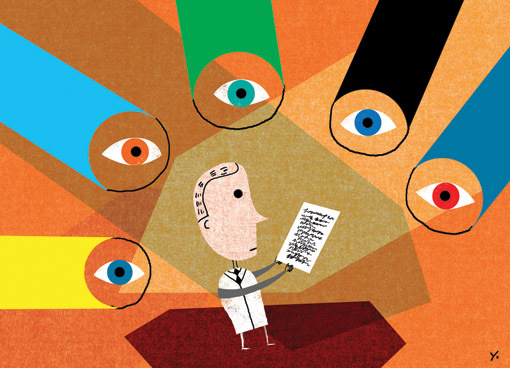 When was the last time you asked how your published research was doing? I also know nothing about how many times my other papers are downloaded from the websites of published journals, or consulted in print in the Library. The latter, no-one can really say about - but the former? It seems strange to me that we write articles (without being paid) and we get them published by people who make a profit on them, then we don't even know - usually - how many downloads they are getting from the journals themselves. That's true enough, I thought. But whose fault is it that I don't know about access statistics for journals I have published in? Heck, have I ever asked for the access statistics for how many times my papers have been downloaded from the journals they are published in? Has anyone? So, Reader, I asked for some facts and figures, regarding the circulation of journals, and the download statistics of my papers. "A reasonable request and we would gladly assist you. Unfortunately we do not have direct access to server logs as our web site is hosted as part of the larger University of Borås web. We will take your request as a good excuse to check into the matter though, and also review our general policy on log data." Most journals got back to me by return of email, telling me immediately what they knew (and being very aware of the limitations of their reporting mechanisms, for example whether or not the figures excluded robot activity, the fact that how long the user stays on the website is not known so accidental click-throughs are undetermined, etc. Such caveats were explained in detail). Emerald, the publishers of JDoc and Aslib Proceedings, were not comfortable in giving me access to wider statistics about their general readership numbers, given this could be commercially sensitive information, which is understandable: they were very happy to give me the statistics relating to my own papers, though. The only journal not to get back to me was LLC , published by Oxford University Press (The editor replied to say he was not sure he had access to these statistics, but would ask). This is ironic, given I'm on the editorial board. I'll press further, and take it to our summer steering-group meeting. 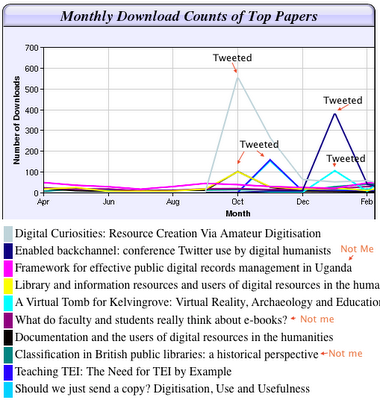 One of my papers published in JDoc (Ross, C and Terras, M and Warwick, C and Welsh, A (2011) Enabled backchannel: conference Twitter use by digital humanists. J DOC, 67 (2) 214 - 237) was downloaded 804 times from the JDOC website during 2011, and was number 16 in the download popularity list that year. The total number of paper downloads from JDoc as a whole during that year was 123,228. Isn't that interesting to know? I have a top 20 paper in a really good journal in my discipline! Who knew? It has now been downloaded 1114 times from their website. In comparison, there have been 531 total downloads of that paper from UCL Discovery in the past 6 months. But the time frame for comparison of downloads with the OA copy from Discovery isn't the same, so comparing is problematic - and there are more downloads from the subscription journal than from our OA repository. Still, it shows a healthy amount of downloads, so I'm happy with that. The Art Libraries Journal - only available in print, not online, were quick to tell me that the journal is distributed to 550 members: 200 going abroad to Libraries/Institutions, 150 sent to UK Personal members, and 200 going to UK Libraries/Institutions. My paper published there (Terras, M (2010) Should we just send a copy? Digitisation, Use and Usefulness. Art Libraries Journal, 35 (1)) has had 205 downloads in the last six months from UCL Discovery, so I perceive that as a really good additional advert for OA: the print circulation is fairly limited, but the OA copy is available to all who want it. My paper in the International Journal of Digital Curation - itself an OA journal - (Gooding, P and Terras, M (2008) Grand Theft Archive: a quantitative analysis of the current state of computer game preservation. 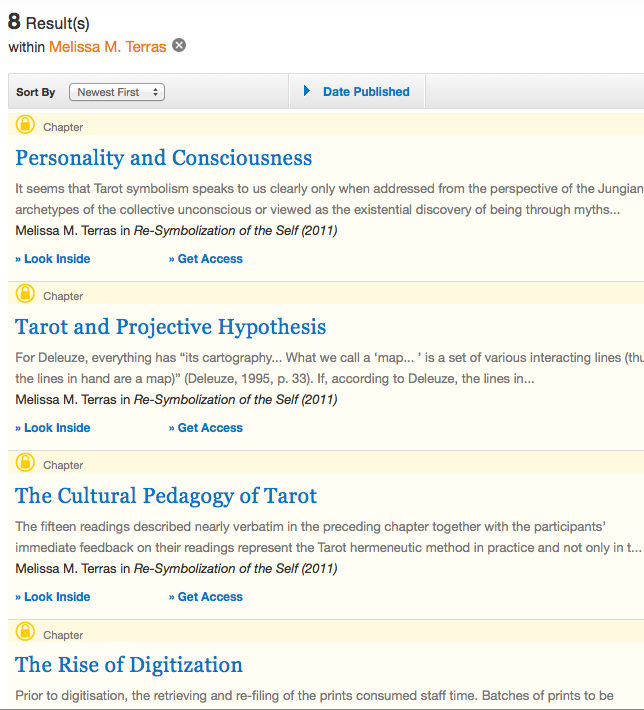 The International Journal of Digital Curation, 3 (2)) was downloaded 903 times in 2009 out of the 53,261 times the full text of a paper was accessed. (The average was 476, with standard deviation 307). In 2010 the paper accounted for 919 out of the 120,126 times the full text of a paper was accessed. (The average was 938, with standard deviation 1045.) That compares to only 85 downloads from the UCL repository, but hey, its freely available online anyway, without having to revert to an OA copy in an institutional repository. It might be worth drawing from this that copies of papers in institutional archives are only really used when the paper isnt available anywhere else, but you would hope that would be obvious, no? InternetArchaeology journal has an online page with their download statistics readily available (how I wish all journals would do this). The journal gets around 6200 page requests per day. But since article size varies widely, with some split into 100s of separate HTML pages, it is difficult to know how meaningful this is. 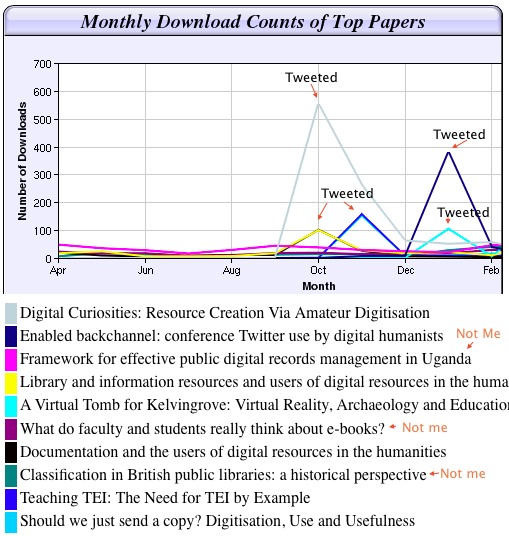 I was sent a spreadsheet of the stats from my paper published there (Terras, M (1999) A Virtual Tomb for Kelvingrove: Virtual Reality, Archaeology and Education. Internet Archaeology (7)) which suggests that there have been 2083 downloads of the PDF version of the paper from behind the paywall since 2001 (but some may be missing due to the way the reporting mechanism is set up) with none in the past year (compared to 276 downloads of this from UCL Discovery in the past six months, so many more from our institutional repository comparing like on like periods). 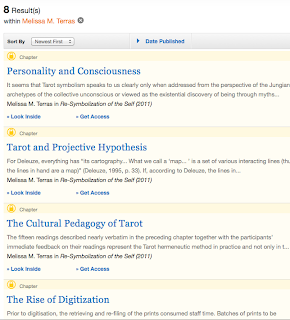 The HTML version of the table of contents has been consulted 16, 282 times since 2001 (this is freely available to all comers) but there have been 67, 525 views of all files in the directory since then - but since the paper is comprised of hundreds of individual files, its difficult to ascertain readership. Judith Winters, the Editor of Internet Archaeology, notes "It is curious that when the journal went Open Access for about 2 weeks towards the end of last year, the counts did increase but not dramatically so" - so when a non-OA journal throws open its doors for a limited time (IA did this to mark open access week last year) its not like access figures go wild. That's really interesting, in itself. If you are still reading, then thanks. This stuff gets pretty turgid. But its been fascinating, for me, to see the (mostly positive) reactions publishers have to being approached about this - and surprising that not more people have actually asked publishers about these statistics. We are giving away our scholarship to publishers, in most cases: shouldn't we get to know how it fares in the wide, wide world? As citation counts, and h-indexes, and "impact" become increasingly important to external funding councils and internal promotion procedures within universities, why would journal publishers not make this information available to authors? But why don't they do it more routinely? Will you need this type of information for the next grant proposal, or internal promotion, you chase? Why would you not be interested in how your research flies? But journal publishers will only start providing authors with this kind of information routinely if enough scholars start to ask about it, and it becomes part of the mechanics of publishing research - particularly when publishing research online. So if you have published in a print journal which has an online presence, or in an online journal, drop them an email to ask politely how your downloads are going*. Do it. Do it now. Ask them. Ask them! 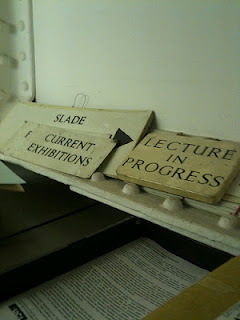 A few months ago I was invited to the Slade School of Fine Art at UCL, by the Head of Department, Professor Susan Collins, to have a poke about in their archive and a chat about what to do with it. Since 1871 the Slade School of Fine Art has educated and trained generations of world-renowned artists, from Gwen and Augustus John, Stanley Spencer and Ben Nicholson around the turn of the 20th century and early 1900’s, to Richard Hamilton and Eduardo Paolozzi in the 1940’s, through to Derek Jarman, Paula Rego, Euan Uglow and Craigie Aitchison in the 50’s and 60’s. 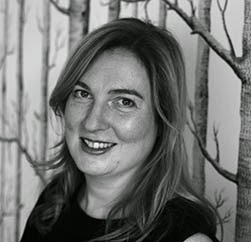 More recent Turner Prize winning alumni include Martin Creed, Rachel Whiteread, Antony Gormley and Douglas Gordon. The Slade has an extensive archive on site which includes objects, papers, photographs, class lists, student records and artefacts dating throughout its history at UCL, which contains rich evidence of the time artists spent at the Slade. However, this archive is difficult to access, and no attempt has been made to present this rich information to a wider audience. The project starts in October, for only a few months, but I'm really looking forward to being involved. Dave Beavan, the UCLDH Research Manager, will also be on the case. You'll hear more about this in the autumn! I just got sent this flyer from the UCL Art Museum. How cool is that? Grin! Henriette's Interpretation Support System (ISS), which forms the basis of her thesis "Building an Interpretation Support System to aid the reading of Ancient Documents". Yesterday was a nail-biting day for me, as I headed over to Oxford to meet Henriette Roued-Cunliffe, one of my PhD students who I supervise with Professor Alan Bowman, to find out the outcome of her doctoral viva. (For those who dont know, the 3 or 4 year process of writing up a 100,000 word PhD, or D.Phil as they call it in Oxford, is examined by a face-to-face grilling with two examiners where you are expected to show you are a worthy intellectual combatant). We had arranged to meet at 5pm (her viva started at 2pm) but there was no sign... 5.30 came and went... then the time edged towards 6... Doctoral vivas in Oxford are usually around 2 hours, so we started to get worried. But then Henriette arrived, slightly dazed but happy - the viva had started late due to one of the examiners being held up in traffic, and the examiners wanted to be thorough and let the viva take its course. But the strange thing about doctoral vivas in Oxford is that they are not allowed to tell you in the exam how you have done! So it wasn't until all the paperwork was filed after that we got the news - around 7pm by now - that Henriette has passed with corrections (which is the best you can hope for!) Hurrah! Champagne all round! You can read about Henriette's doctoral work, "Building an Interpretation Support System to aid the reading of Ancient Documents", here. Henriette demonstrates that this can be used to help experts search through different hypotheses and record the interpretation process of reading an Ancient text, whilst consulting and reusing existing information sources from other projects. 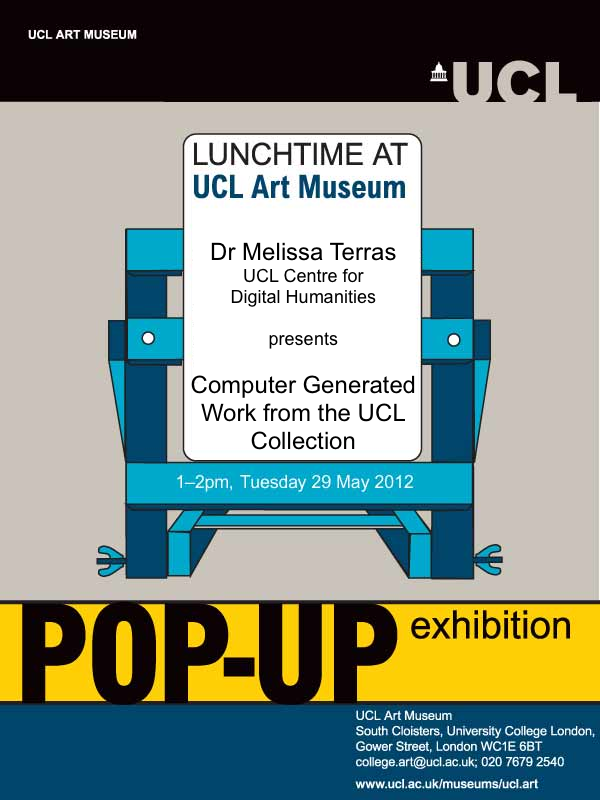 Well, to find that out you'll have to come by on Tuesday 29th May, 1-2pm! Free entry. See you there? So, I admit, I committed a crime in social media circles. I created some content that I thought a few people may be interested in, posted it, then promptly went on leave for four weeks and didn't follow up here. Sorry. Real life cant be helped though (we had to vacate our house for four weeks as it is being massively extended and I took the boys out of the way while walls came down and went up again. And when I got back the internet was broken in my shed). Q. What do the following people have in common? Vaksman Innes, Keown Yabne, Noelia Laun, Carmella Tunney, Tanisha Hendricks, Aaron Faubli, Lee Buffet, Sharron Romanowski, Hudson Swift, Tia Printz, Padilla Roldan, Greg Jeffries, Sillman Harry, Marylou Freas, Buyus Philmen,Defosse Sutton, McMammon Whitney, Shallom McGettigan, Perla Barras, Pretzer Colwyn, Yme Hockstra, Leane McGwin, Castera Drew, Ducci White, Cryssie Amberd, Jamel Gaskin, Hoaglin Little, Runels Stewart, Mei Tobery, Tish Dreith, Gus Cinco, Elke Fayad, Corey Thomen, Elza Edel, and Gemma Batterton. A. They dont exist. For the past couple of weeks I've noted down the "name" of the spam bots messaging me on twitter. Goodness, spam bots are irritating, yes. But look at these names - aren't they fabulous? What is it about the randomly generated names that make them seem so fascinating, so charismatic? The combination of strings of known characters wont take into account any of our tacit understanding of the cultural norms of naming, nor its traditional sounds, beats, or cadences. It makes them seem other wordly, known but ridiculous, celebrity like. Which means perhaps we will pay them more attention? The names are delibrately set to be at the rare and obscure end of the naming bell curve? An article from a good few years ago in the New York Times - before Twitter was even imagined - summed up the automatic name generation tools used by spammers - suggesting that online tools such as the Random Name Generator (based on data from the US Census to randomly generate names, with even a setting provided for how obscure you want them to be) are routinely used to generate these never-were spammers. I'm as irritated as the next person by spam. What a waste of our resources. But in some alternative universe, my people-named-after-spam-bots are dancing late into the night, Vaksman with Marylou, Tanisha with Lee, the growing spam roll-call being the mother of all social-media party invites spiraling out of control. 3,057 manuscripts have now been worked on, up 82 on last week’s total; this is the biggest seven-day increase since the week ending 4 January 2011. The 3,000-transcript mark has now been comfortably broken, and congratulations to volunteer Diane Folan for transcribing her 1,000th manuscript, and volunteer JFoxe for having transcribed her 500th manuscript in little over six months. Volunteer Lea Stern isn’t far off the 500-transcript mark either. We were delighted to see that the Public Record Office of Victoria in Melbourne have utilised and customised the software developed for Transcribe Bentham by the University of London Computer Centre, for their own pilot transcription project. We heartily recommend that you take a look, and if you wish to use the code for the TB transcription interface, you can find it here. That's right. The code we made is now in use by another institution, to do their own transcription project. Hurrah! It was always our aim in Transcribe Bentham to provide the code to others: it was a key part of our project proposal. But you always have to wonder if that is going to happen. Its the kind of thing that everyone writes in project proposals. 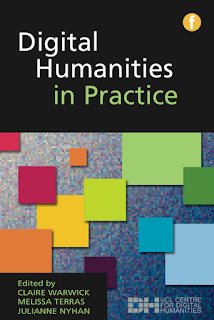 And whilst lots of people talk about making things in Digital Humanities, and whether or not you have to make things to be a Digital Humanist, we've shied away - as a community - from the spectre of reuse: who takes our code and reappropriates it once we are done? How can we demonstrate impact through the things we've built being utilised beyond just us and - quite frankly - our mates? So I'm happy as larry that the code we developed, and the system we have built, is both useful to us, but is now useful to others. I'm not sure how much I want to prod the sleeping monster that is general code reuse in Digital Humanities... dont draw attention to our deficiencies! But I would be delighted if anyone else could point me to examples where code and systems in Digital Humanities were repurposed beyond their original project, just as we would wish? I popped over to Paris a few weeks ago to Keynote at "L’image-document face au numérique : mise en crise ou mise en lumière ?" at the Institut national d'histoire de l'art, 5 mars 201. It was great to meet Parisian Digital Humanities folks - and I did my best to follow the papers given by French Art Historians regarding how their work is being changed by computational method. The organiser of the conference, Elli Doulkaridou, has storified the tweets from the day - capturing the flavour of the discussion. Greetings from an hotel room in Munich. 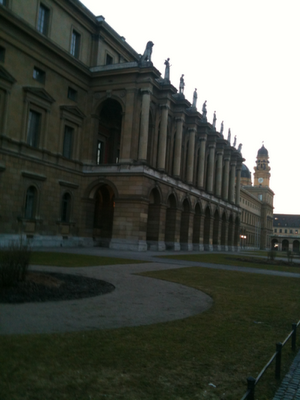 I cant not blog from here: I was hear to talk about this very blog at Weblogs in den Geisteswissenschaften at Die Bayerische Akademie der Wissenschaften, today. It was only a 20 minute paper, plus questions, looking at my personal experience of blogging, how this place has developed over time: for example how I used to post "cool stuff what I had found" online here, and now that stuff gets posted to twitter, and this blog is for more reflective content. I talked about the distinction between personal and professional, and where to draw the line at telling people things about your private life, which can be difficult sometimes. I talked about leaving yourself open to snark, and worse, trolls. I talked about developing confidence in this sphere. I talked about how I've been putting up little stories about my research, and the type of effect this has had on downloads of papers, etc. I talked about how you balance between the public outreach, and public engagement and actually sitting in front of your computer to get some, ya know, "real work" done. I talked about the reader stats of this little blog (about 100 readers a day now, when I havent posted anything new, and anything around 500 readers a day on the days I have posted something new). All backed up with slides of my previous content posted here. Fun, and some interesting discussions followed about whether we should be encouraging students to do this kind of thing, issues of self confidence in the blogosphere, why there arent more women academic bloggers, and so on and so on. I then got interviewed for 30 minutes for a documentary for Austrian National Radio on blogging (which I wasn't expecting) and for something for someone in Switzerland about Digital Humanities (I have no idea what that is even for, apparently they will email me) and then talked to Cornelius Puschmann for an hour about my blog, for his research - on the motivations of academic bloggers. The whole day was very thought provoking: it has strengthened my belief in why I should bother/continue to keep up posting these random musings here, how beneficial it has been to my career (I met lots of people today who actually read my blog - that is why I was invited here!) 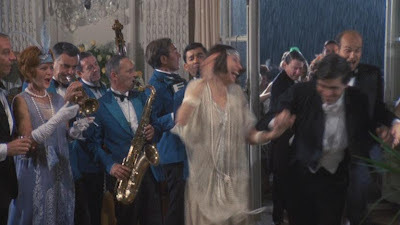 and... well, it just allowed me to contextualise what I am up to a bit more, in my own head. Its been a busy ten days. I should have four or five hours tomorrow in Munich before I have to head back to the airport, so I hope to see an exhibition, as a reward. I didnt even get to tell you about going to Paris on Monday, to keynote there. So in the past 10 days or so, I've keynoted in Edinburgh, Paris, and given this talk, as well as been in London for a day 8.30-7pm with meetings back to back, including examining a phd upgrade. Some of that has to wait for another day. Time to recharge, both my computer, and my own batteries. And tomorrow, time to go home. I'm not going anywhere else for three whole weeks! I lately joined the Museum Computer Group which has a very active discussion list, and a question was posed lately about how many physical visitors do museums get, versus website traffic these days. @Mia_out helpfully pointed to the UK's Department for Culture, Media and Sport's "Sponsored Museums: Performance Indicators 2010-11" which included downloadable spreadsheets of performance indicators like physical and web visitors at http://www.culture.gov.uk/what_we_do/research_and_statistics/8609.aspx. Here I've quickly juxtaposed the total physical visits to museums sponsored by DCMS with their corresponding total web visits (there arent any more nuanced stats, before you ask). Although the ratio varies from museum to museum (check out the V+A! 8 times as many online visitors as physical visitors!) it just gives demonstrable proof of how important web presence is to cultural and heritage organisations. Have a look (below, I'm having bother with blogger and tables...). Fascinating.